This “2 on 1” CD includes the soundtracks of the two movies “Terror After Midnight” and “A Man Could Get Killed”. The latter’s theme tune Beddy-Bye became the hit of the century Strangers In The Night. There are also two bonus tracks: Love Theme and Flight To Mecca, the two theme tunes from the movie “You Can’t Win ’Em All”. 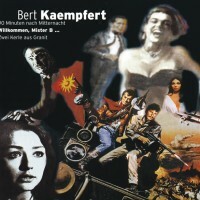 The colourfully illustrated booklet with the CD includes details about the soundtracks composed and recorded by Bert Kaempfert.